The Derny is famous in France. Its design has hardly changed from that of the earliest motorcycles - essentially a bicycle with an engine attached.It's front-mounted petrol tank is particularly distinctive. Its fame is as a result of solo Dernys being used as pacers. In fact, the word derny has become a generic term for motorized pacers. In 1936, France's new socialist government ordained that the French people could have an annual national holiday. 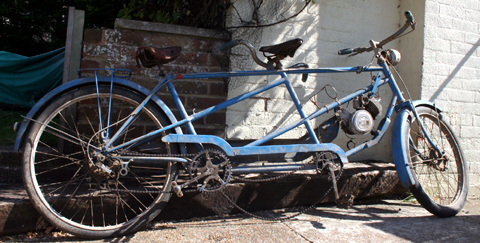 An industry promptly grew up around summer vacations, and bicycle tandems became popular; some manufacturers started to make motorized versions to cash in on the tandem craze - a much faster way for a cycling partnership to get down to the south coast - but production was interrupted by the war. Production resumed post-war. But by 1953 or so, scooters had become the new chic two-wheeler and old-fashioned motorized tandems soon became obsolete. The idea of the Derny was designed and constructed by two French ex-racing cyclists called Roger Derny and Sons. 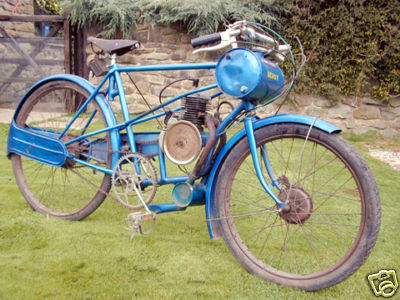 This was the conventional motos de stayer (in the UK, Big Motors is the term used today). These type of pacing machines used first for the Bordeaux-Paris were not very reliable for road use. So another type of pacing machine had to be designed. And as a result the Derny was born and put into production in 1938. The Derny brothers first factory was at 81, Avenue St. Mande and later they moved to Avenue du General Bizot, both in the French capital. When the parent factory closed in 1956, Derny machines for the Bordeaux-Paris were maintained and rebuilt by Service Derny of 88, Rue Picpus, Paris until 1974. Derny carried on making other types of machines but closed in 1958. 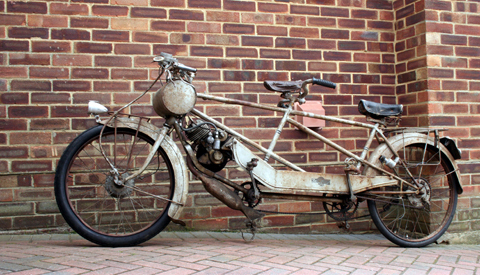 Later on, another type of Derny was re-introduced called a Burdin. This machine had many problems: the mobylette engine and the frame were not strong enough for the job. Many manufacturers have tried to change the design over the years but have gone back to the original design because it is still as good today as it was way back in 1938. Pacers today are still called Derny - a fitting tribute to the Derny brothers who first thought the idea up in the first place. 1951 Derny Tandem Vap engine Image provided by www.BuyVintage.co.uk.